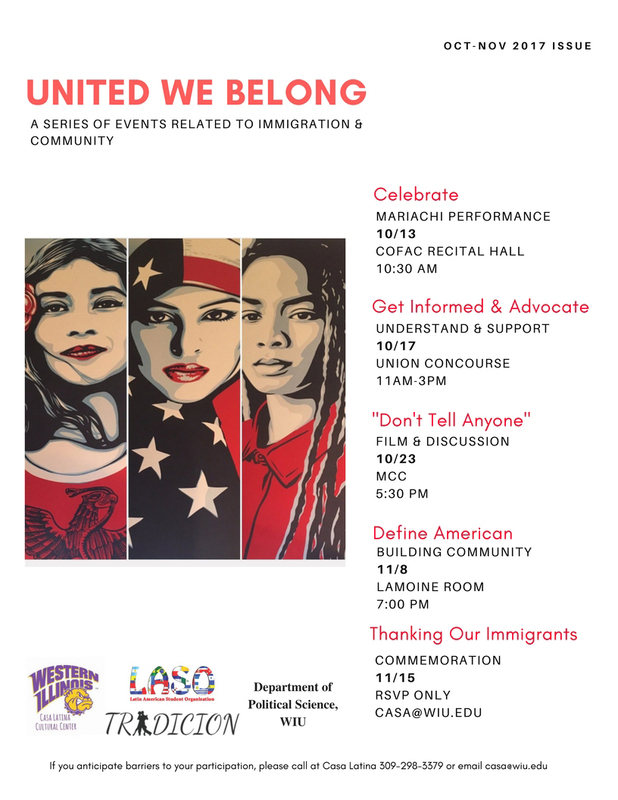 MACOMB, IL – A series of events related to immigration and the community will be held throughout October and November at Western Illinois University. • Friday, Oct. 13, 10:30 a.m. in the College of Fine Arts and Communication (COFAC) Recital Hall - "Celebrate," a mariachi performance. • Tuesday, Oct. 17, 11 a.m.-3 p.m. in the University Union Concourse – "Get Informed and Advocate." • Monday, Oct. 23, 5:30 p.m. in the Multicultural Center – Film screening and discussion, "Don't Tell Anyone." The film is a 2015 Peabody Award winning documentary focusing on immigrant activist Angy Rivera, who shares her parallel journey of coming out of the shadows as undocumented and a survivor of sexual abuse. • Wednesday, Nov. 8, 7 p.m. in the University Union Lamoine Room – "Define American: Building Community." The event is a combination of media, dialogue and a peace walk. • Wednesday, Nov. 15 – RSVP only - "Thanking Our Immigrants: Commemoration." The events are sponsored by the Casa Latina Cultural Center, the Latin American Student Organization, the Tradicion dance team and the WIU Department of Political Science.